It's happened. It almost happened overnight. New York has become a smelly, sweaty puddle of angry people, AKA summer. Yesterday I was wearing leggings and a long top (as per usual - I look like I have been dragged through a bush 90% of the time), and today I am all of the sweaty. So gross. I closed the windows and snuck the aircon on today 'for the kittens', because mama cat gets too hot and crazy stressed as soon as I even think about turning on the oven, so I gotta keep it pleasant for her. That's what i'm saying anyway. The kittens are suddenly almost 6 weeks, and have grown up so fast from teeny little squirmy sausages to the cutest things IN THE WORLD. I am low key obsessed with them, and I am already scared about saying goodbye to them. Does anyone want to adopt them? Ideally you will be ok with me coming around every day to snuggle them. I'll bring treats. I promise! One of the only good things about this gross hot weather, aside from day drinking and excessive amounts of rosé, is cheese boards! 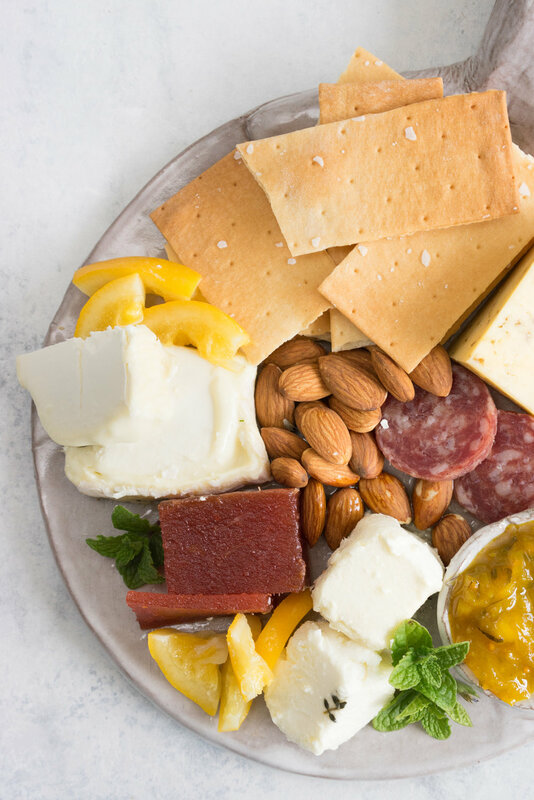 Actually, that is a lie, cheese boards are amazing all year round, but there is something about sitting outside with friends and having an epic cheese board! I usually have at least 5 types of cheese in my fridge at any given time, because I am often hungry when I go to whole foods and therefore have zero control, which results in excessive cheese purchasing. The number of cheese I have at any given time has only increased since I started spending time with my New York Mum, who is the cheese wizard. Every time I go around to her house I try a new crazy sort of cheese that she has, get addicted to it, and have to immediately make a special trip just to buy it. We went on a little adventure yesterday and ended up at a whole foods, where I got even more types to try! The best. I tend to just throw whatever I have in the fridge on the board. I usually try to go for something soft, something harder, something interesting, and something goaty, and then just some interesting add-ons, something sweet, and some sort of relish. This time I went with a cumin seed gouda, a marinated sheep and goat feta that I am OBSESSED WITH and you must try immediately, and a Vermont Creamery Coupole. I had plans to also pop on a bit of sharp cheddar, but I think I got hungry and carried away, and found it on the bench after the shoot. I also added some almonds for a bit of texture, a really nice salami, and some preserved lemons, because they go on / in everything these days since I made a giant jar a few months ago. Then there was a little brick of home-made quince paste, which I inadvertently made a GIANT TRAY of back in quince season (will share the recipe this season), so we are still working our way though it 6 months later. Luckily it keeps well. I finished the board off with some crackers, a little fresh mint, and a home-made zucchini relish, which has become a total fave in our house! The relish is a cheese board game changer. When we have guests round for dinner (which is usually 2-3 times a week because I much prefer having people round than going out), I plonk whatever cheese I have in the fridge on a board, and pop a jar of the relish next to it, so everyone can just make their own snacks. The relish is a lovely combination of sweet and tart, and is crazy easy to make. I always, always get asked for the recipe, so figured I would finally pop it up here! Provided you grate and sweat the zucchini and onion ahead of time, the actual cooking process is only about 20 minutes, and is super easy to scale if you were wanting to make a bigger batch. It's also great on sandwiches, sausages, scones, stirred into quiche, anything that needs a little lift in flavour. If you are planning to store this, make sure that you have sterilised jars. I tend to use pint-sized mason jars, and I give the glass jars 15-20 minutes in the oven to kill any bugs. Make sure that you always use new lids - these can be bought separately. Use a larger pot than you think you will need - this has turmeric in it, so splashes can stain easily. I like to also use plastic or metal utensils rather than wood to avoid turning them yellow. Provided you get a good seal on your jars, this can be kept at room temperature until you are ready to use it. Once it is open, store it in the fridge. Wash and grate the zucchini. Place into a large bowl. Add the finely diced onions. Salt heavily, and stir well to combine. Leave for at least 2 hours to allow the zucchini and onion to sweat. In a large pot, combine the sugar, vinegar, mustard seeds, celery seeds and turmeric. Bring to the boil and simmer for 10 minutes, stirring occasionally. Drain and rinse the zucchini and onion, squeezing out any excess moisture. Add to the pot and cook for 10 minutes, stirring to ensure it does not catch. Mix the flour with a little vinegar to make a smooth runny paste. Add to the pot, and cook until the relish thickens slightly. Pour into sterilised jars, and screw on lids tightly. Allow to cool completely before using. Store in the fridge once open.